An increasing number of skiers & mountaineers are realising what fantastic experiences ski journeys away from the pistes and in to the mountains can give. Aesthetic and efficient in ascent and swift and stylish (sometimes!) in descent. The ski mountaineer is able to mix the fun of off-piste skiing with the deeply satisfying environment of the mountaineer. 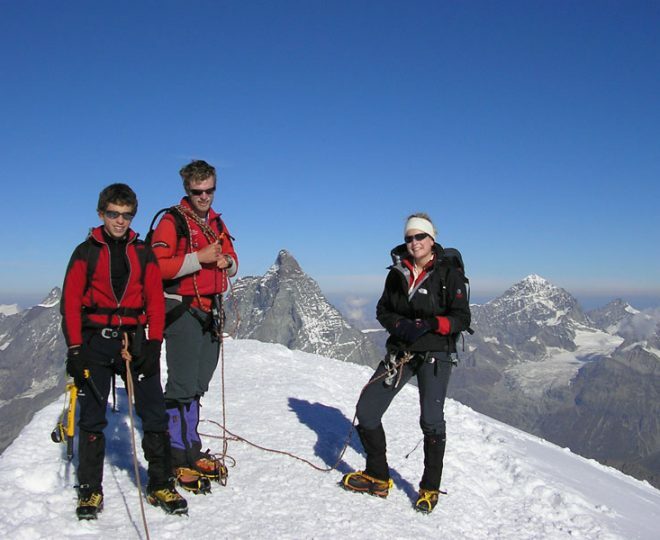 On this introductory 5 day course course we aim to train you in the essential skills required for smoothly completing some classic alpine ski tours and becoming a strong member of a ‘back-country’ ski team in the process. – Provide very high quality training so that you develop the skills for off-piste skiing and ski touring safely and efficiently. – Effective (and enjoyable!) skiing techniques for different types of off-piste terrain. – Understanding your ski touring bindings and becoming efficient in their use. – Skinning – How the skins work, putting them on and taking them off, breaking trail and choosing a line, easy angled & steep turns (Kick turns). 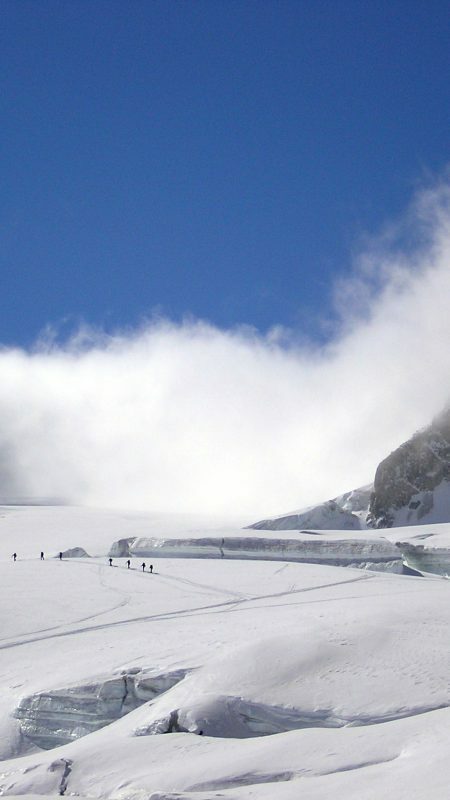 – Avalanche awareness, route planning and safe travel techniques. 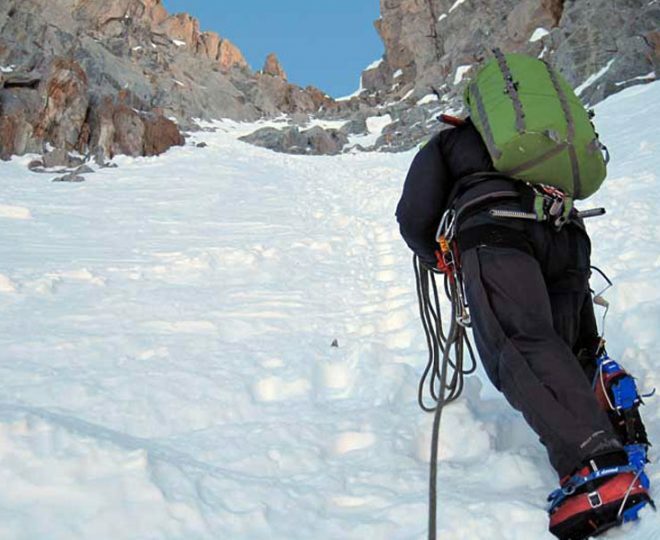 – Becoming skilled in the use of your essential avalanche equipment, shovel, probe and transceiver. – Managing ‘transitions’ (e.g. being efficient transferring from skinning to skiing modes). – Storing skis on your rucksack if you need to travel on foot. 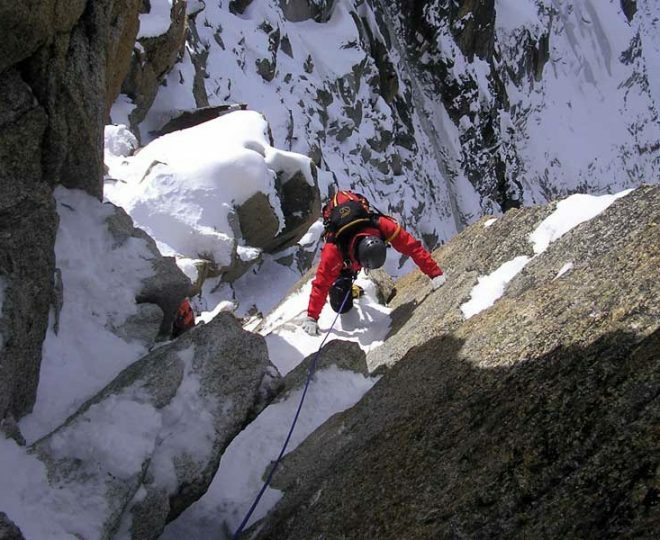 – Familiarising with your mountaineering equipment – ice axe, crampons, harness. – Introduction to ski glacier travel and the use of the rope. 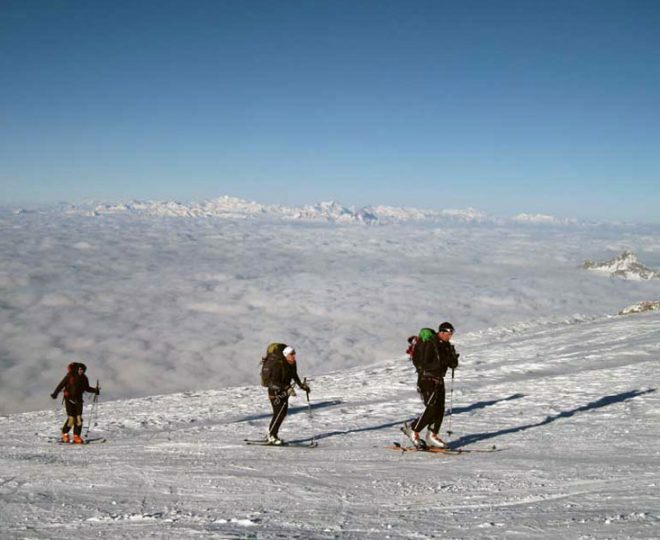 – Prepare you for further off-piste and ski touring adventures (e.g Skiing The Benevolo ski mountaineering Tour). – Have a fun & sociable week & meet up with other like minded ski touring folk who you may be able to ski with in the future. 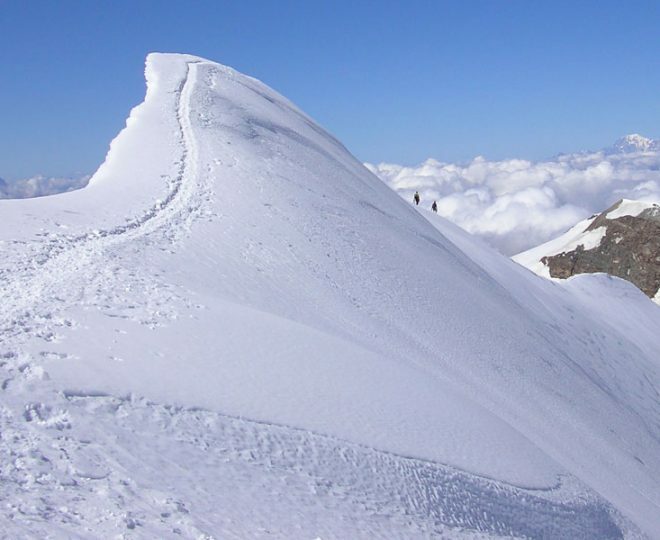 The Gran Paradiso area in Italy is a renowned ski touring area with a huge range of ski touring options and excellent huts. The Benevolo hut, situated in the Gran Paradiso, gives access to a number of good ski peaks with great north facing ski terrain with the best chances for good snow to ski. 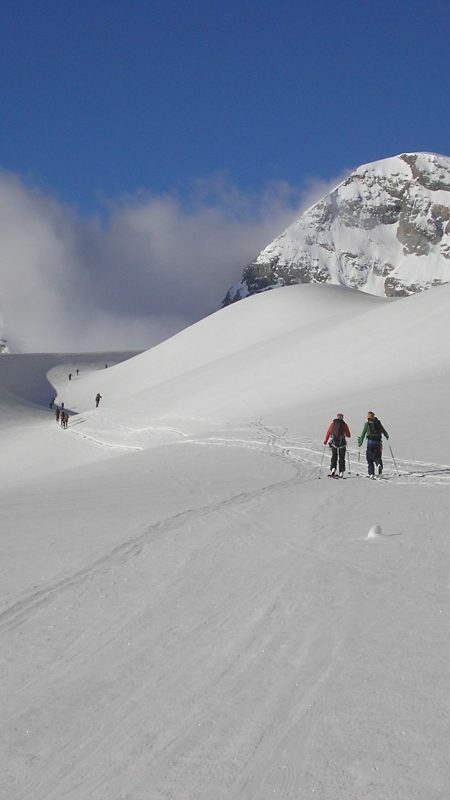 This 4-day trip of relaxed ski touring close to the Benevolo hut is a great choice for your first multi-day ski tour. You’ll get a fantastic flavour of what it is to ski away from resorts, enjoy the social aspects of hut life and get a taste of the remoteness of the mountains. 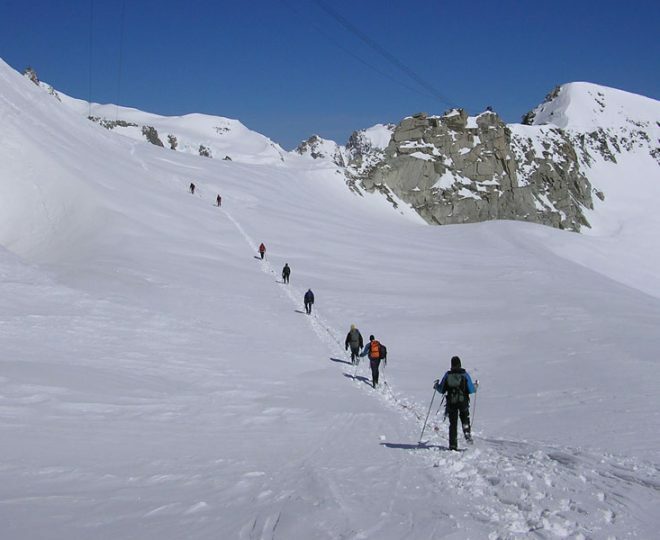 – Complete some classic medium to long length ski mountain journeys in the Courmayeur Valley and surrounding area. 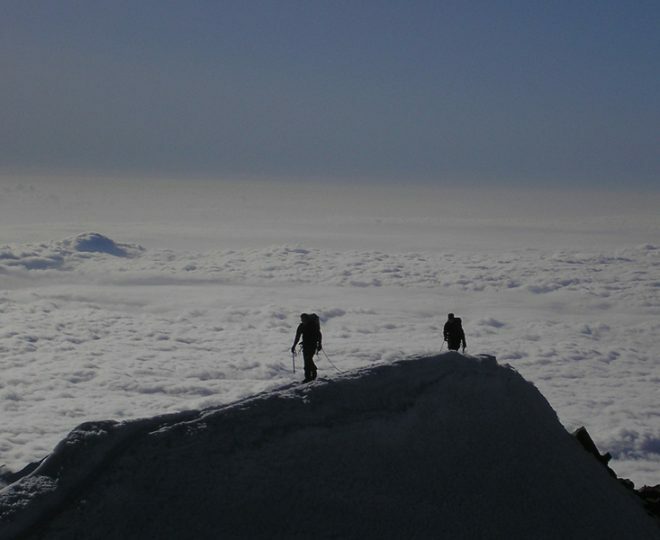 – Spend a night in a mountain hut allowing a good journey to be made and early start to complete a long tour. – This course has less structured training than the Intro Ski Touring Course and is aimed at folk already competent in the basic ski mountaineering skills. Whilst these skills will be revised during ongoing training throughout the course, the emphasis will be on getting some big journeys and great skiing done. 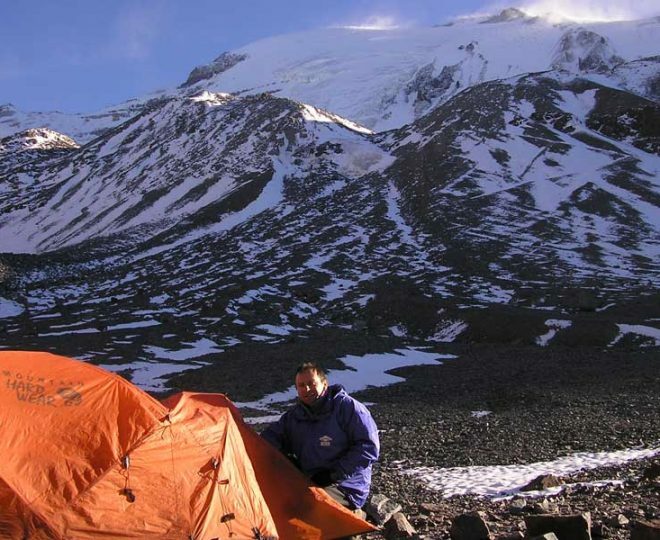 – Provide an excellent spring board, at the start of the classic hut to hut touring season, for other challenging ski mountaineering trips in the spring. – Have an enjoyable and sociable week meeting up with other like minded ski mountaineers who you may end up skiing with again in the future.